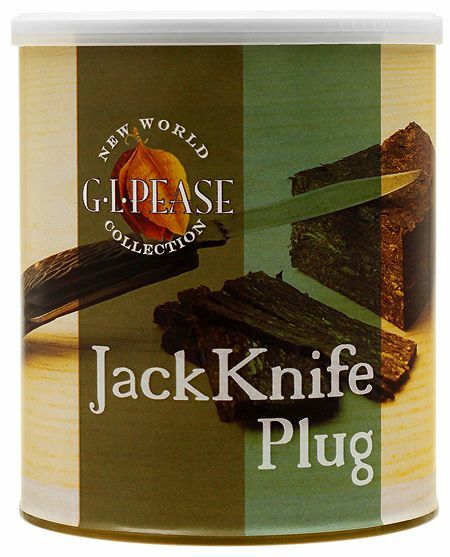 the first in the New World Series from GL Pease, JackKnife Plug is an all natural blend of dark-fired Kentucky leaf and red, ripe Virginia tobaccos layered on a central core of golden flue-cured leaf. The whole provides deep, earthy flavors with a hint of bright sweetness. The tobaccos are pressed and matured in cakes before being cut into 2oz blocks. JackKnife is a stout blend with the dark-fired leaf adding a subtle smokiness and a finish reminiscent of dark chocolate while the Virginia tobaccos provide a sturdy backbone. Slice it thick and rub it out for a ribbon cut, slice thin for a shag, or chop it into cubes. The choice is yours.